Buchiawase Daiko is a festival piece from Kainan Shrine on Miura Peninsula, just outside of Tokyo, Japan. Neighboring villages were said to have competed for a successful harvest at sea. While the winning village was promised a bountiful fishing season, the losing villagers' drums were destroyed and tossed into the ocean. The historical piece is no longer played at the place of origin, but many groups across Japan have been inspired by the piece, and have resulted in many variations as each group adopted and interpreted the song in their own way. ​The common thread for this piece is the team of three drummers who take turns showing off their playing on a single drum. The speed of the rhythms gets faster and faster as each soloist takes their turn, and culminates in the three drummers dynamically switching in and out in shorter and shorter intervals. Nen Daiko's interpretation of this song is based on the version played at Jiyuu-no-mori Secondary School in Saitama, Japan. It was originally taught to the school by Hounen-za’s original member and second director, Masanobu Sato, from Miyagi, Japan. 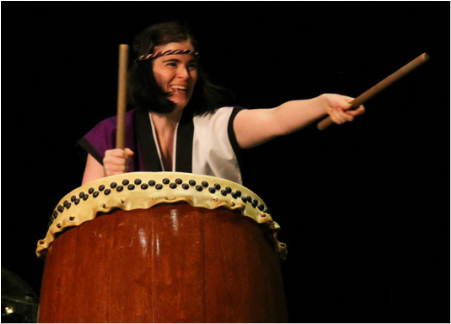 Buchiawase Daiko is a lot of fun because we play characters with big personalities. Nen Daiko members are encouraged to tap into their inner machismo as we try to one up each other and demonstrate who is the best. When we have more than one team on stage, it becomes a true battle! The first soloist is a strong and steady leader, and commands the room with just his/her presence. The second soloist clowns around and is mischievous and playful. The third soloist is fiery, intense, and wild. The base rhythm you hear underscoring this song is "santoko dokkoi." This is why the song is sometimes called Santoko Daiko. Feel free to shout it out to give us encouragement when we perform! 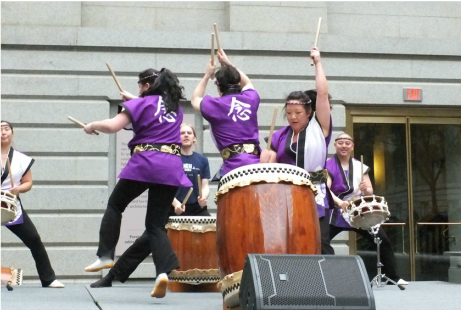 When playing the third soloist's part, Nen Daiko members are known to take inspiration from the Muppet, Animal, on the drums. Watch when the drummers in the background tap the stage with their bachi and shout out. We are pumping up our energy and excitement as we prepare to tag in. This video starts with the third soloist tagging in. 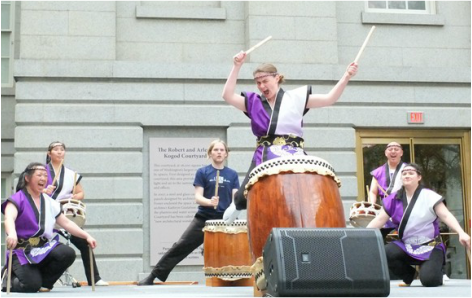 Notice the drummers sizing up the competition during the battle and enticing the audience to cheer for their team. This video shows a moment from the song Buchiawase. Come to an in-person performance to see the full song! Charlottesville performance when the drum spun around on the slippery tile floor but the soloists kept going! Fireworks performance when the climax of the piece coincided with the fireworks starting behind us. 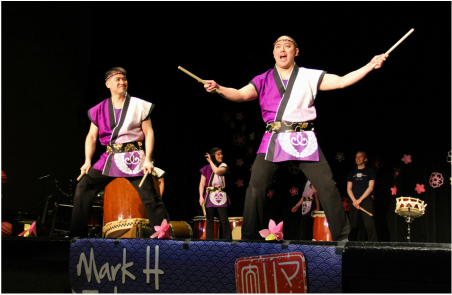 20th Anniversary concert in 2014 when we invited past Nen Daiko members to lend their energy on stage.